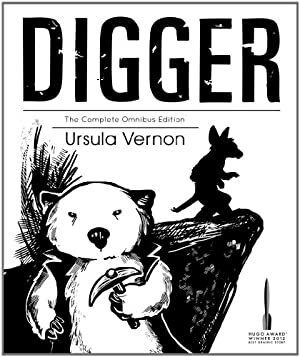 Surka primarily appeared in the Digger webcomic by Ursula Vernon. It ran from 2003 to 2011 and won a number of awards (including a Hugo) and very positive reviews. She also pops up in Nurk, a children’s book also written by Vernon and published in 2008. Real Name: Surka Aurelia Maxine Shrew. Known Relatives: Nurkus Aurelius Alonzo Electron Maximilian Shrew (aka Nurk, grand-son), at least one child (deceased), a sister (possibly named Minerva). Group Affiliation: Former leader of the Rotting Dogs. Base Of Operations: A bridge. Height: 12cm or so. Weight: Less than 200 grams. 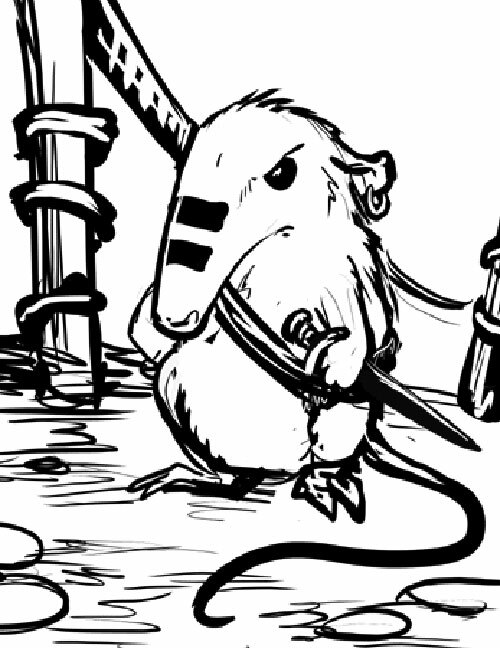 A good fighter (though what a shrew can accomplish in a fight can be limited). Has a natural authority and take-charge nature that make her a good leader. Surka is no spring chicken. The events of Digger take place after those of Nurk, so she has a grown-up grandson. Yet she shows zero sign of it and seems in excellent physical shape. Her “troops” are a pair of trolls. These are large, very strong and very tough. 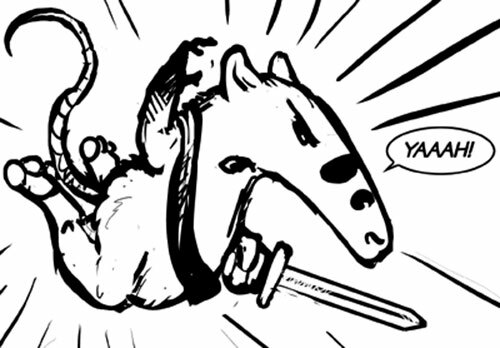 Trolls also can gallop about as fast as a horse. However, during daytime they are considerably slower and more sluggish. Lady Surka has led a life of adventure. Not all of it is documented, but she once visited the Outer Hebrides. She also helped a kingdom of dragonflies (as in 4’ tall dragon-like creatures with insectile wings) not too far from her home. 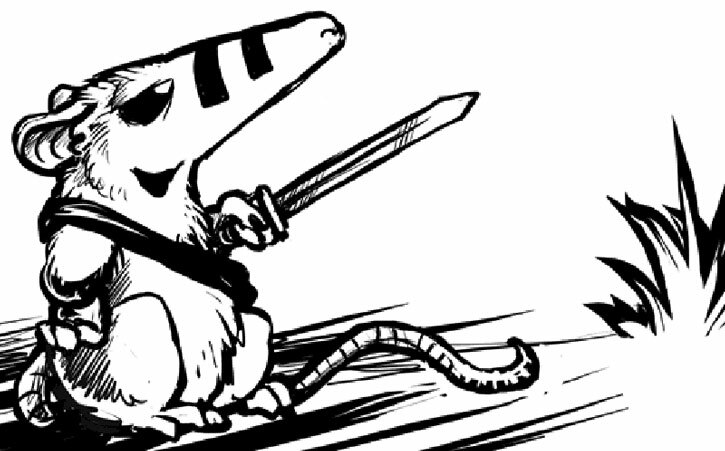 She adventured along with battle hamsters who may have been Viking-like. She also met a rhyming people called “wind gypsies”, from whom one apparently shouldn’t buy oranges. Her career high point was being a pirate queen. She led a crew of leper pirates known as the Rotting Dogs. These were good at piracy but lacked somebody with authority and common sense. The Dogs were quite successful under her captaincy. They retired to a pleasant island with their loot before their adventures and medical condition would leave them thoroughly crippled. Looking for new opportunities, Lady Surka worked as an assassin then as a dishwasher. 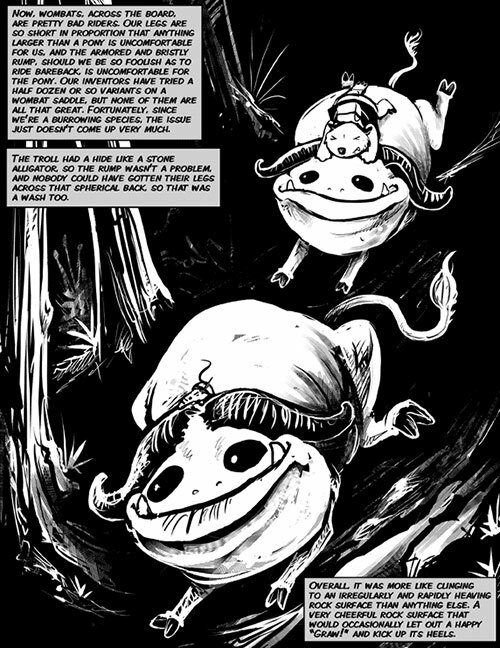 Then she somehow defeated a mean ol‘ troll named Lumpy Frogsnuggler in the Cerulean Hills. This is how she earned control of his bridge. 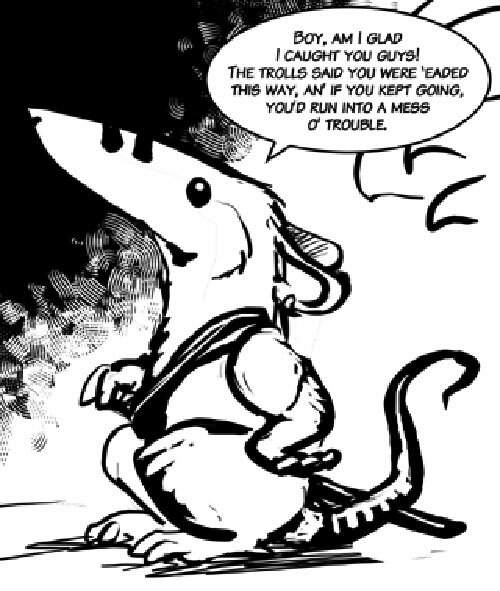 In her new career as a bridge troll (well, as a shrew working as a bridge troll) she led a pair of actual trolls. These presumably used to work with Frogsnuggler. Surka was fluent in the troll language. And like the Rotting Dogs before them the trolls liked having a competent leader telling them what to do. Surka met and befriended the wombat Digger. 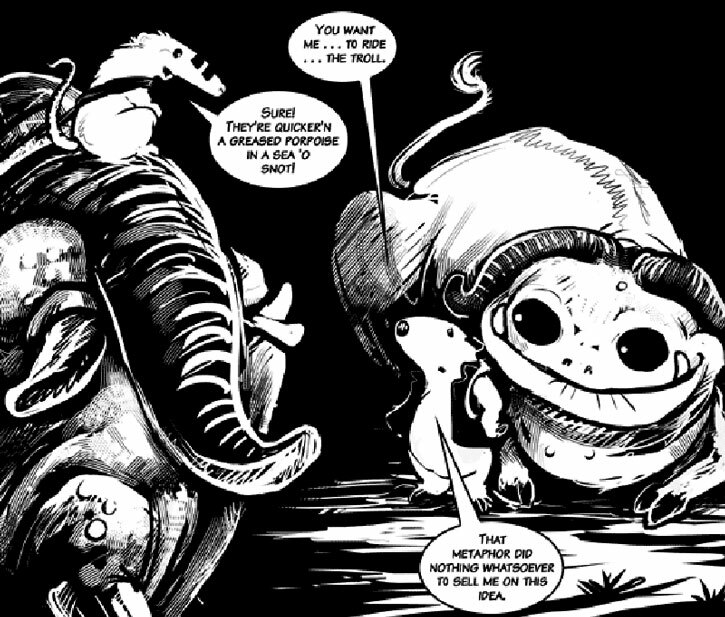 The shrew troll and her troll trolls thus twice saved Digger’s life. They were also present (or at least tried to) during the final confrontation at the temple of Ganesh. After the events in the Cerulean Hills, Surka is known to have sailed on a pirate ship to the Barbary Coast, then returned to her homeland for a while. Surka speaks with the traditional pirate accent. She appears to have some sort of war paint over her snout. Surka is a fierce pirate adventurer. She’s known for her courage and unwillingness to back down unless it’s clearly the only workable option. She’s not that interested in killing people, though. All of her jobs may have involved either fighting or washing dishes, but she’s not bloodthirsty. Surka will apparently always let people surrender. Part of her motivation is meeting interesting people and monsters – and, in her quality as a bridge troll, take their goats. She’ll easily befriend intriguing and charismatic adventurers. Surka will probably drop the matter of the billy goats “toll” to just a bit of a sandwich and interesting conversation when it comes to these. Another big part of her motivation is getting into strange and dangerous situations. Which she finds very exciting and not at all intimidating. Surka is not a reasonable person. She has little time for old-fashioned social mores or most forms of common sense. Super-Hearing only for high frequencies. Area Knowledge (Cerulean Hills and presumably others), Iron Nerves, Language (Troll and presumably others), Lightning Reflexes, Misc. : despite being tiny, Surka can somehow speak or yell just as loud as a human. 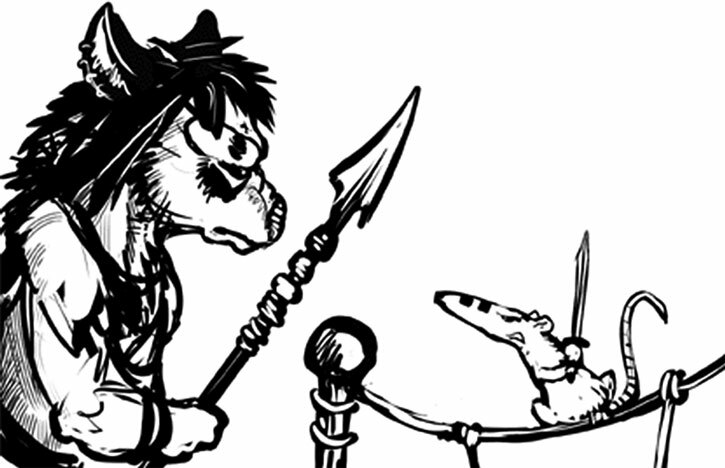 Digger (Low), a pair of actual trolls (High). Shrew-sized cutlass [BODY 02, EV 01 (00 w/STR)]. 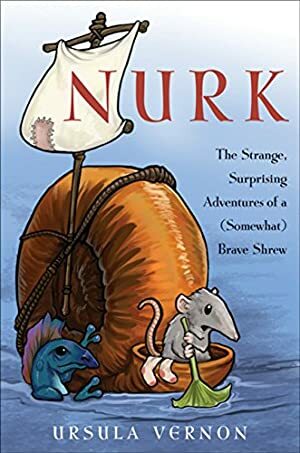 Source of Character: Ursula Vernon’s Digger comic and her Nurk: The Strange, Surprising Adventures of a (Somewhat) Brave Shrew children’s book. Writeup completed on the 4th of October, 2014.